This could not be a more aptly titled movie. 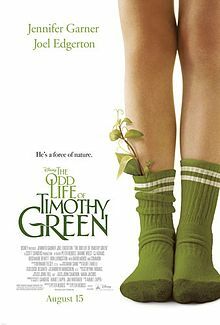 Not only is Timothy Green’s life odd, this film about his odd life is itself odd. It falls into a small category of films featuring mysticism/fantastical events that in no way ever seeks to explain said elements. It simply is. And, while the “just go with it” attitude is refreshing in that it allows you to not overthink, it also calls into harsh relief the things that they do choose to question. Get it? His last name is “Green” and he’s kind of a plant? Get IT?! The story centers on a seemingly magically created little boy that appears in the garden of a childless couple. All the standard things happen in that the boy changes everyone’s life for the better. In fact, everything that happens in this movie is so predictable that you have to wonder why it was made at all. It’s not like it’s breaking new ground. The actors all do a fine job, it’s competently directed and the writing is, for the most part, serviceable And that’s it. A totally blah film about a totally average family that comes together in a magical way. But, there it is, that magic. For the most part ignored throughout the film, the central conceit is that this child sprang fully formed through…wish fulfillment for lack of a better term and it’s only barely questioned. By anyone. This child has magic leaves growing from his ankles and still almost no questions are raised. But, when Timothy makes friends with a girl from “the wrong side of the tracks”- read as she’s vaguely sullen and therefore everyone is convinced she’s bad news even tough she’s actually “artsy”- the main characters not only question but they interrogate, admonish and stalk until they get some answers. But, your imaginary friend comes to life and that’s basically ok? Doesn’t quite jibe. I also have concerns about the ending of the film. Not to get spoilery but Timothy is an oddly prescient child when it comes to his own situation. Wouldn’t it have been more advantageous, and less cruel for all the players to know all the rules right at the beginning? I realize that I’m being vague here, but if you’ve seen it you get it and if you haven’t…well the ending is visible from a mile away in the trailer so calm down.